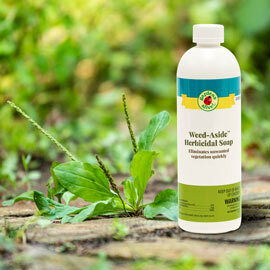 Weeds in Stone & Gravel Driveways; a Superior Solution! | Gardens Alive! P. S.: Your advice about using shredded leaves for mulch was great – my privet hedge never looked so good! Mike: Is napalm an organic product? It seems to be my last resort, unless you can come to the rescue of a long gravel driveway that used to be about ten feet wide. Over years of weed & grass encroachment, it's down to about 7 feet, and not even straight! I'd like to be able to kill off both the weed and grass enlargement while doing minimum damage to anything else, including me and the environment! Any ideas? 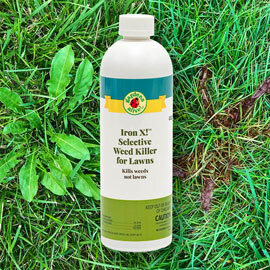 A while ago, I heard you talk about just letting the grass (or weeds) grow in your driveway or parking area of your home. My parking area is just gravel, and I am always fighting to keep it clean of grass and weeds. But I don't think I want a hundred square feet of the areas favorite weeds. Thank you. A. I too, have a gravel driveway at my home. I was told by the previous owners to make sure I had a fresh load of stone delivered and spread on it every five or so years and to stay on top of the weeds. I soon discovered that small, individual stones over top of dirt make an exceptional planting medium. Weed seeds blow in, grass encroaches from the lawn, and both not only thrive, but are able to resist pulling much better than weeds in plain soil, as the stones tend to make it really hard to get to the base of the plant—which you need to do for effective pulling. For the first couple of years, I pulled out the biggest, most deep-rooted ones (plantain, dandelion, etc.) when the soil was soaking wet. (They made great composting material; those roots are loaded with nutrients.) The others I torched with a flame weeder or sprayed with herbicidal soap or high-strength vinegar when the weather was hot and dry. And once, before I knew better, I went after them with a weed whacker. That last stroke of genius led to the costly replacement of a really big—and yes, relatively new—Anderson window. Them whacked stones go flying, baby! We couldn't afford to pave the driveway; there were too many much more important things to do in an old house ("honey! the water pump has been running non-stop for a week and is now bright red and glowing…. "), and I didn't want to add another impervious surface to the planet. As annoying as the gravel was, it did a good job of managing storm water in general and specifically served as a kind of wetland buffer for my raised beds when we had the occasional Biblical downpour. Then I had an appearance at a Flower Show in Wichita, Kansas, and my hosts put me up at an historic bed and breakfast in town. As I sipped my morning coffee in the breakfast room, one of the other guests asked, "are you here for the Frank Lloyd Wright house?" "Yes," I lied, "eh; where is it again?" "Why, its right down at the end of the block." It was not open to visitors at that time of year, so I banged on the door, talked my way in, and while chatting with the caretaker, noticed that his car was parked on what appeared to be a lawn. It had been pouring rain recently and I asked if that was a good idea. He laughed and took me out to show me that the 'lawn' was actually a driveway of pavers especially designed to allow plants to grow through lots of little holes in each paver. "We didn't want an ugly black driveway right outside this magnificent structure, and we knew that bricks or pavers alone would become a weedy mess," he explained, so they installed these special pavers, seeded the area and kept the grass mowed over top. As I watched, a heavy landscaping truck pulled onto the 'lawn', seemingly in defiance of physical reality. It was a remarkable illusion—and a great inspiration. As soon as I got home, I leveled the stones and then just let Nature take over. When it got high enough to mow the first time, it was really spotty. But by mid-summer it was more than three-quarters filled in—and looked great! I had this remarkable sea of green that used water much better than the stones alone, was creating loads of oxygen, could be walked on comfortably in bare feet, and made visitors gasp when I parked them there during soaking wet times. And I got my summers back—no more pulling, burning or spraying! Numerous companies make the kind of specialized pavers and plantable grid systems I saw in Wichita, and if you're planning this kind of project new, I urge you to go on-line and take a look at some of the numerous options available; search terms like 'eco-pavers' and 'living driveways'. If you already have a gravel or stone driveway that's in decent shape, you could try what I did: level it out, mark the outlines with those tall reflectors on a stick, let Nature work for awhile and then start mowing regularly.